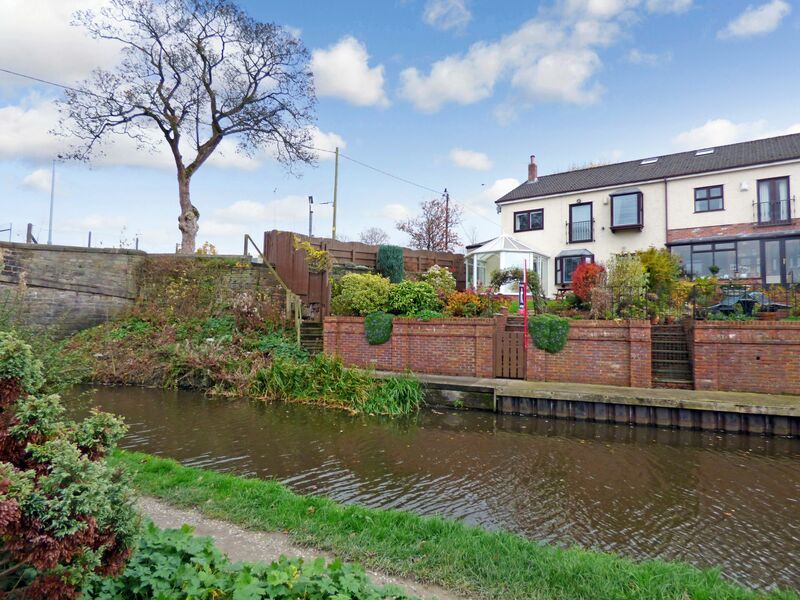 Ian Tonge Property Services are pleased to market for sale this outstanding luxury 4 bedroom 2 bathroom end mews house, situated in a sought after residential cul de sac backing onto the canal with potential mooring facilities and outstanding views of the surrounding area. The property has been maintained to a high standard, boasting accommodation over three floors with four double bedrooms, two bathrooms, downstairs W.C, hallway, lounge, dining area, breakfast kitchen, conservatory, integral garage, block paved driveway to front, flagged area to side, landscaped rear garden with steps leading down to the canal side. The views to the rear are truly stunning and an internal inspection of this exceptional property is highly recommended. The property is offered for sale with NO ONWARD CHAIN. uPVC double glazed entrance door, dado rail, staircase leading to first floor, single radiator, understairs storage cupboard, oak flooring. uPVC double glazed window to front aspect, matching suite comprising of: low level W.C and wall mounted hand wash basin. Single radiator, oak flooring. uPVC double glazed window to rear with fitted blinds, double radiator, cornice to ceiling, dado rail, T.V. point, feature living flame gas fire with tiled hearth and decorative surround, patio doors leading through to conservatory. uPVC double glazed window to front aspect, double radiator, cornice to ceiling, dado rail. Floor to ceiling windows with tilt and slide door leading out to the garden area. Oak flooring. Wall mounted convection heater, cat/dog flap, lovely views out to garden canal side and surrounding countryside. uPVC double glazed window and door with fitted blinds to rear aspect, Good sized breakfast kitchen with a range of fitted wall and base units with granite worksurfaces, tiled splashback, composite twin bowl sink and drainer with mixer tap. Smeg integrated electric fan assisted oven, four ring gas hob with extractor and light above, tall fridge freezer, automatic dishwasher, integrated microwave. Double radiator, kick plinth fan heater, space for breakfast table, tile effect laminate flooring, door leading to integral garage. uPVC double glazed window with fitted blinds, box seat and matching tilt and open door with Juliette balcony, gas living flame effect fire, convection radiator, T.V point, access to dressing area and stairs leading to second floor and en-suite. with lighting, shelving and single radiator. uPVC double glazed window with fitted blinds to rear aspect, fitted double wardrobe, single radiator. uPVC double glazed window to front aspect, fitted double wardrobe, single radiator. uPVC double glazed box seat window to front aspect, range of fitted wardrobes to one wall, single radiator. uPVC double glazed window to front aspect, white fitted suite comprising of:- bath with shower attachment, low level W.C, hand wash basin with vanity unit, corner shower unit, chrome heated towel rail, fully tiled walls, slate effect tiled flooring. Gallery landing with velux to ceiling, banister rail overlooking master bedroom. Matching three piece suite comprising of:- low level W.C, pedestal hand wash basin, panelled bath with shower attachment. Half tiled walls, tile effect laminate flooring, velux to ceiling. with multi-point hot water boiler servicing en-suite and utility area. with remote control electric up and over door, power and lighting, wall mounted Vaillant Combi boiler, hand wash basin, shelving. 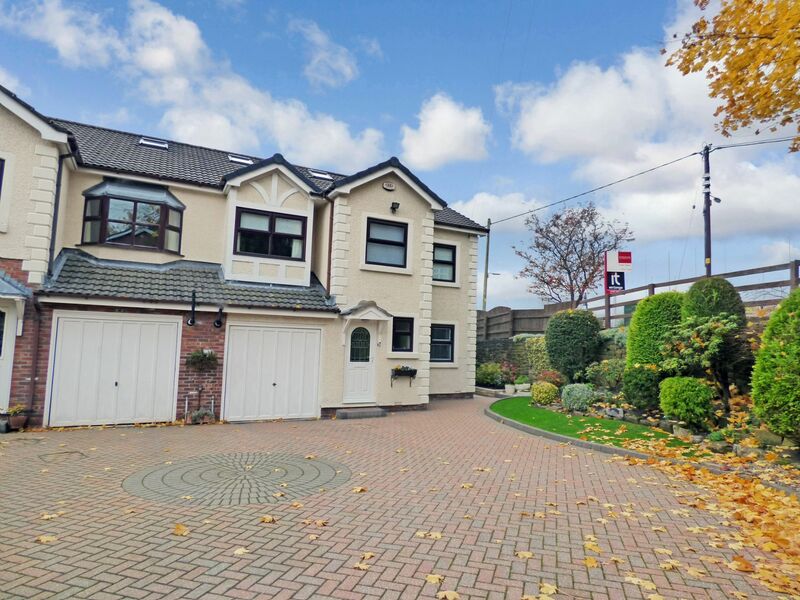 The front garden is landscaped with a generous block paved driveway leading to integral garage. Pleasant combination of dry stone walling, planting and fencing to the side, with a flagged area and timber shed. Secure timber gates leading to rear garden. The rear garden is mainly laid to lawn with Indian Stone flagging, patio and well stocked borders. There is also direct access down to the canal mooring via a private timber gateway. From High Lane, head in the direction of Disley, turning left at the White Lion Public House onto Dryhurst Lane, then right onto Hollinwood Road where The Moorings can be found on the left hand side and is clearly identified by our For Sale Board.